Orion Canada Congratulates its Clients on World Class Quality! MTM Automation & Aerospace (www.mtmautoaerospace.com) has achieved AS9100D and ISO 9001:2015 certification from CMA Quality International. WorldReach Corporation (www.worldreach.com) helps national governments improve the safety and security of international travellers and those living abroad. Its software is used in more than 140 countries. After a flawless audit, the company was certified to ISO 9001:2015 by its registrar: the Canadian General Standards Board (CGSB). Konnexis Inc. (www.konnexis.com) are experts in sterilization control and monitoring systems. They achieved their certification to ISO 9001:2015 from BSI in November 2017. Egg Farmers of Canada (www.eggs.ca) has achieved ISO 9001:2015 certification for its Operations Department. Orion Canada congratulates these and its other clients for their leadership in their respective industries. Orion Canada assists mission critical organizations to improve operational efficiency and effectiveness through the implementation of process and management best practices that positively impact the bottom-line. Orion Canada's expert consultants specialize in designing and implementing lean and measurable quality management systems. Its consultants hold the highest industry credentials as consultants, practitioners and auditors. Orion Canada assists mission critical organizations to improve operational efficiency and effectiveness through the implementation of process and management best practices that positively impact the bottom-line. Orion Canada's expert consultants specialize in designing and implementing lean and measurable quality management systems. Its consultants hold the highest industry credentials as consultants, practitioners and auditors. Orion Canada Authors FREE Guide on Regulations for Medical Devices! Rapid changes continue to reshape the regulatory framework for medical devices as industry moves ever closer towards global harmonization of quality systems for medical devices. Orion Canada, the recognized leader in this field in Canada, was contracted by Global Affairs Canada to write an update to Orion Canada's popular "must have" reference guide for medical device manufacturers. The 2017 version addresses current requirements. It is recommended reading for those new to medical devices and and a practical source of information for experienced practitioners. The Orion Canada reference guide is not intended to be a “how to implement” guide for a particular standard. Rather, it should be viewed as a road map to help medical device manufacturers determine the quality standards that apply to their products. • Europe’s Council Directives 93/42/EEC of 14 June 1993, concerning medical devices including the revision 2007/47/EC and 98/79/EC of 27 October 1998, concerning in vitro diagnostic medical devices; Commission Directives 2000/70/EC of 16 November 2000, concerning Human Blood or Plasma; 2003/12/EC, 3 February 2003, on the reclassification of breast implants and 2003/32/EC of 23 April 2003, with respect to medical devices utilizing tissues of animal origin. The Orion Canada reference guide briefly describes other features of these jurisdictions, including device classification, registering a quality system, selecting a registrar or notified body, post-market surveillance and problem reporting, labelling, EU representation, and the Federal Drug Administration's (FDA) premarket notification and premarket approval. Useful information sources pertaining to each jurisdiction are also provided in the reference guide. If you would like a free e-copy of the 226 page reference guide and/or assistance with your compliance to regulations, you may contact Orion Canada at info@orioncanada.com. Orion Canada congratulates the Commonwealth Independent States Navigation Inc. (CISN) on their successful audit to ISO 9001:2015. The company achieved this certification following a thorough certification audit by their registrar: Intertek. CISN (www.cisnav.com) provides trans-Atlantic delivery services for millions of tons of sea cargo annually. Canadian Patent Office achieves ISO 9001:2015 Certification! Orion Canada congratulates the Canadian Intellectual Property Office (CIPO) on achieving ISO 9001:2015 certification. CIPO (www.cipo.gc.ca) is responsible for the administration and processing of the greater part of intellectual property (IP) in Canada. CIPO's areas of activity include trademarks, patents, copyright, industrial designs and integrated circuit topographies. Orion Canada Offers Low Cost ISO 9001:2015 Internal Auditor Training! Companies looking for a low cost option for ISO 9001:2015 training up to 10 internal auditors are in luck! Orion Canada offers its 2 day internal auditor course to companies in Ottawa for only $1790 + HST. This is not the cost per person, it is the total cost for the course delivered at your business. The course will be customized to include your internal audit procedure. Not only will you get full training on the standard and internal auditing practices, you will benefit from the experiences of an instructor with a minimum of 500 audits of experience. 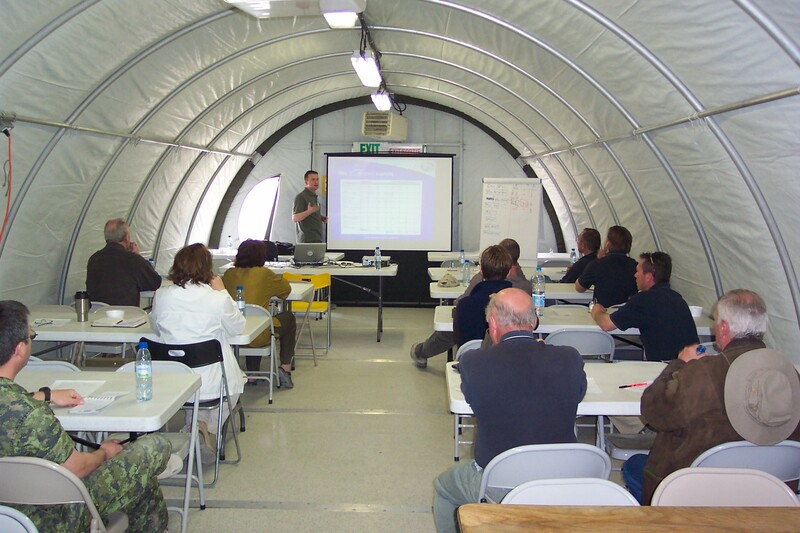 Orion Canada instructors have trained hundreds of auditors and hold the highest auditor certifications. Official certificates are provided to those who successfully complete the course. You won't be disappointed and you won't be gouged with overpriced training! Contact Orion Canada Inc. to schedule this popular course. New Certification to ISO 9001:2015! Orion Canada extends its congratulations to Orenda Energy Solutions on achieving ISO 9001:2015 certification. The certification audit was not only Orenda Energy's first audit, but the first initial ISO 9001:2015 certification audit of a quality system by the registrar: SGS Canada. It was not an upgrade audit. Orenda Energy has operations in Iroquois Ontario and Edinburgh Scotland (UK). It supplies international markets with innovative and efficient turbine power systems designed and manufactured through its world class ISO 9001:2015 certified quality management system. OMSK Carbon Group Achieves ISO 9001 Certification in Record Time! OMSK Carbon Group needed to achieve ISO 9001 certification and they needed it fast! Its Russian-based parent company is among the largest producers in the world of carbon black, a material used to make tires and industrial products. But its newly established North American distribution hub did not have the quality management system to match its other operations. Orion Canada was selected based on its international reputation, experience with small and start-up businesses, and its willingness to work to a very aggressive goal: certification in less than three months. Congratulations to OMSK Canada on this accomplishment and on implementing a world class quality system that is as efficient to manage as it was to implement. The most anticipated business standard in history was published when the International Organization for Standardization released the ISO 9001:2015 standard. Members of the ISO Technical Committee ISO/TC 176 overwhelmingly approved the release of ISO 9001:2015 Quality Management Systems - Requirements. Only minor editorial corrections were made to the FDIS version. "The latest version of the ISO 9001 provides a framework that may be used by any organization to achieve business excellence," says Joe FitzGibbon, President of Orion Canada Inc. "Perhaps the most significant changes are the introduction of risk management, and a common standard structure that better facilitates the integration of multiple management systems such as ISO 27001 Information Security and ISO 14001 Environmental Management." Registrars will allow three years for ISO 9001:2008 certified organizations to transition to the new standard. Orion Canada Inc. has provided consulting and audit services related to ISO 9001 and other standards and best practice models for more than 20 years. The Canadian consulting company has assisted hundreds of organizations throughout North America, Europe and Asia to achieve certification and measurable improvement to their efficiency, effectiveness and management credibility. Contact Orion Canada for additional information on ISO 9001:2015 transitions. Orion Canada has been privileged to begin working with the Cree Nation of Eastmain. The Council of this community has demonstrated leadership through its commitment to make the best use of its assets and resources through the implementation of quality management best practices. Orion Canada has partnered with other aboriginal organizations to optimize management practices. Contact Orion Canada for additional information on improvements to your organization. A Second ICAO Section Achieves Certification after Flawless Audit! Orion Canada is pleased to congratulate the International Civil Aviation Organization (ICAO) Field Personnel Section on their initial certification audit by the British Standards Institute (BSI). Following a comprehensive audit, no non-conformities were raised and the company was recommended for immediate certification. Congratulations! It was June 2013 when ICAO's Field Operations Section set the bar for business excellence when it passed its initial audit with flawless results. Orion Canada is pleased to congratulate Ontario Medical Supply (OMS) on their initial certification audit. Following a comprehensive audit (five days over two visits), no non-conformities were raised and the company was recommended for immediate certification. OMS stocks over 10,500 items and provides medical products and services throughout Canada. Orion Canada's expert consultants specialize in designing and implementing lean and measurable quality management systems. Its consultants hold the highest industry credentials as consultants, practitioners and auditors. Orion Canada is pleased to congratulate Panacis on their flawless initial audit. The company achieved ISO 9001:2008 certification following a thorough certification audit that raised no corrective actions. 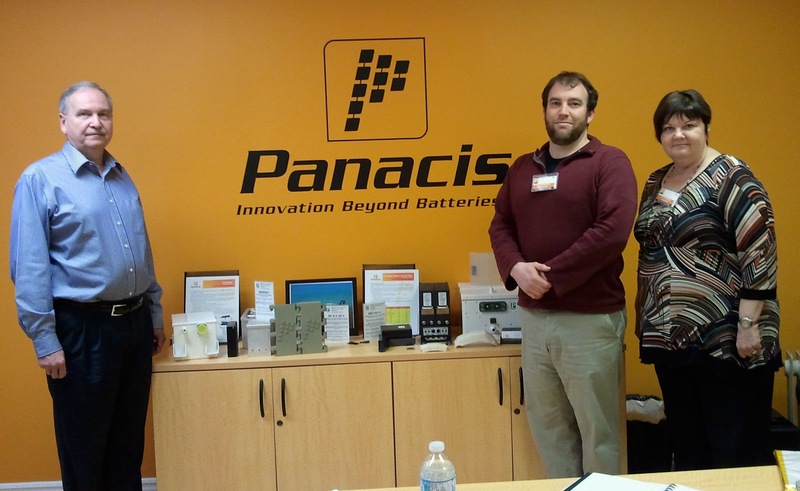 Panacis designs and manufactures advanced lithium ion batteries and powerpack systems for mission critical applications. Panacis technology has been used for battery powered flight, military, medical and other mission critical applications. Orion Canada Inc. consultant Donnie O'Connor (middle), with the Panacis Vice President (left) and the SGS auditor (right). Methanex Corporation (TSX:MX) has engaged Orion Canada to provide technical expertise on quality management pertaining to its Canadian plant operations in Alberta. Methanex is a Vancouver-based, publicly traded company and is the world's largest supplier of methanol to major international markets. Orion Canada assists mission critical organizations to improve operational efficiency and effectiveness through the implementation of process and management best practices that positively impact the bottom-line. Orion Canada's expert consultants specialize in designing and implementing lean and measurable quality management systems. Its consultants hold the highest industry credentials as consultants, practitioners and auditors. Titan Medical Inc. (TSX Venture: TMD) has chosen Orion Canada for medical device consulting services. Titan is focused on the development and commercialization of robotic surgical technologies. Orion Canada has extensive experience working with advanced technology engineering firms requiring rigorous processes that enhance research creativity and provide strong management oversight. Orion Canada's team of certified medical device auditors in Canada and Europe will assist Titan to achieve its compliance targets. After an extensive evaluation of international management system consulting firms, the International Civil Aviation Organization (ICAO) selected Orion Canada to guide it in the design and implementation of a world-class quality management system for its procurement operations. A team of Orion Canada consultants will work with ICAO management with a goal of certification by the end of March 2012. Canadian Bearings Ltd. has selected Orion Canada to provide it with ongoing quality management services. Orion Canada's expertise ensures the efficient and professional management of its ISO 9001 certified quality management system (QMS). Canadian Bearings Ltd. is Canada's leading bearing and power transmission distributor. It has served Canadian industry for over 60 years and has annual sales in excess of $165 million. Its focus is to remain the preferred supplier and single source choice for total quality service and the lowest cost distribution channel. Orion Canada is pleased to congratulate TenXc Wireless on their flawless audit. The company received a recommendation for ISO 9001:2008 certification after the thorough three day process audit by SGS raised no corrective actions. TenXc Wireless supplies performance enhancing antenna products to wireless service providers and radio access network vendors worldwide. TenXc's innovative solutions allow network operators to improve network performance, spectral efficiency, and coverage in a rapid, cost-effective manner. Its customers service over 100 million subscribers. Orion Canada Inc. consultant Chris FitzGibbon (second from left), with the TenXc Wireless Executive VP (left), Director of HR, Quality Manager and SGS auditor (right). Orion Canada's popular Reference Guide for Manufacturers Selling Medical Devices in Europe, Canada and the United States has been updated to reflect current medical device regulations. The publication is sponsored by Industry Canada and will be published in English and French. As soon as the French translation and final editing are complete, the 189 page document will be available to medical device manufacturers for download free of charge. Since its initial publication in 2001, the Guide has been used by thousands of medical device manufactures wishing to sell product in Canada, United States or the European Union. Contact Orion Canada to be among the first to receive the publication when it is officially available. Orion Canada extends congratulations to PHD Medical for achieving certification from the Ministère de la Santé et des Services sociaux (MSSS) in Quebec. PHD Medical's Televisit product has been certified under the stringent RTSS (Réseau de télécommunications sociosanitaire) requirements. The RTSS program is based on the security and performance attributes of the ISO 9126 - Software Quality Characteristics international standard. Televisit now joins the Province of Quebec's limited list of certified healthcare products. Orion Canada assists mission critical organizations to improve operational efficiency and effectiveness through the implementation of process and management best practices that positively impact the bottom-line. Orion Canada's expert consultants specialize in designing and implementing lean and measurable quality management systems. Its consultants have worked with PHD Medical on achieving several strategic quality and certification goals. Beware... The Health Canada Inspectors are Coming! More manufacturers of class 2, 3 and 4 medical devices, who also import/distribute medical devices, are experiencing Medical Devices Establishment Licence (MEDL) inspections for the first time. These inspections cover the medical devices listed in the MEDL. In a warning to all medical device manufacturers selling in Canada, Joe FitzGibbon, President of Orion Canada, stated, "If you hold an Establishment Licence, you should be prepared for a Health Canada inspection in 2009 or 2010". Although all class 2, 3 and 4 medical device manufacturers have ISO 13485:2003 certification, Joe FitzGibbon cautioned that, "ISO 13485 certification does not automatically mean a successful Establishment Licence inspection". c. failure to suspend the establishment licence would constitute a risk to the health and safety of patients, users or other persons. In accordance with section 44 of the Regulations, as soon as a MDEL is suspended, the license holder is required to immediately suspend all activities related to importation or sale of medical devices until such time as the MDEL is reinstated. Orion Canada has assisted numerous manufacturers of class 1 medical devices and importers/distributors of class 2, 3 & 4 medical devices pass their MEDL inspection. The ISO 9001:2008 Quality Management Systems - Requirements standard has been published by the International Organization for Standardization (ISO). This version of the standard clarifies existing requirements related to outsourcing, personnel competencies, work environment, and identification & traceability. An appendix to the standard identifies all revisions. The International Accreditation Forum (IAF) has determined that accredited registrars (organizations who issue ISO certificates) will have one year to transition to the new ISO 9001:2008. Organizations holding ISO 9001:2000 certificates must upgrade to ISO 9001:2008 by October 2010. The upgrade to ISO 9001:2008 may occur during a regularly surveillance audit or renewal audit. On November 15, 2008, the International Organization for Standardization (ISO) also published the significantly enhanced companion guidelines: ISO 9004:2008 Managing for Sustainability - A Quality Management Approach. ISO 9001:2000 is the most widely used quality management standard with nearly one million certificates issued worldwide. Orion Canada assists mission critical organizations to improve operational efficiency and effectiveness through the implementation of process and management best practices that positively impact the bottom-line. Orion Canada's expert consultants specialize in designing and implementing lean and measurable quality management systems. Its consultants hold the highest industry credentials as consultants, practitioners and auditors. Orion Canada clients AMITA Corporation and WorldReach Software were the first two organizations in North America to achieve ISO 9001:2000 certification. Orion Canada is pleased to congratulate Arnprior Aerospace on the certification of its design and development methodology to the AS9100b standard. The company achieved this expansion to the scope of their QMI certification in July 2008. Orion Canada is pleased to congratulate R.E. Gilmore Inc. on yet another management system certification. In addition to its existing ISO 9001:2000 certification and its Forestry Stewardship Council Chain of Custody Certificate (FSC COC), SGS has granted certifications to OHSAS 18001 Occupational Health and Safety Management and ISO 14001 ISO 14001 – Environmental Management Systems. R.E. Gilmore provides integrated supply chain solutions to a global customer base. Orion Canada has assisted R.E. Gilmore and other Gilmore operating units such as Doculink International Inc. and Gilmore Global Logistics Services Inc. to achieve international recognition of its management system best practices. Its fully integrated and certified quality, environmental and occupational health & safety management systems distinguish R.E. Gilmore as an industry leader. AMITA Corporation was recertified to ISO 9001:2000 by the Canadian General Standards Board (CGSB) following another flawless audit. For twelve straight years, AMITA has demonstrated its leadership in quality management by not receiving a single corrective action request from its accredited registrar or any of its clients. This outstanding performance is virtually unequalled within the software industry. AMITA's reputation for high quality software and supporting services was established when it was among the earliest adopters of ISO 9001 in its industry back in 1996. Four years later, it received international recognition when it became the first organization in North America to be officially certified to the new ISO 9001:2000 standard (December 15, 2000 - Press Release). AMITA Corp. outsources the maintenance of its quality management system to Orion Canada. Orion Canada is pleased to congratulate software development company, CaseWare IDEA Inc., on its recommendation for ISO 9001:2000 certification. The company passed its January 2008 initial certification audit without a single corrective action being raised by the auditor. CaseWare IDEA builds data analysis and audit software applications. 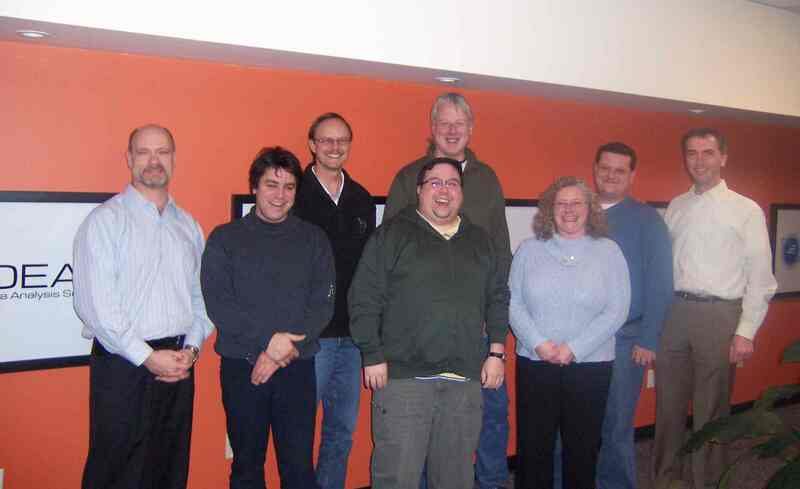 Orion Canada Inc. consultant Chris FitzGibbon (right), with the CaseWare IDEA management team and the BSI auditor (left). Orion Canada is a full service quality system consulting company servicing industry leaders throughout North America. Orion Canada delivers quality improvement consulting, process assessment and audits, quality system maintenance outsourcing, and customer satisfaction measurement services. Orion Canada is pleased to having been selected by the Canadian Space Agency (CSA) as the preferred vendor of quality assurance services for its high profile eOSTEO research project. This key scientific research is aimed at eliminating bone density depletion associated with Osteoporosis and long term space flight. The research, jointly sponsored by the CSA and European Space Agency (ESA), will fly aboard a Russian Foton M3 spacecraft in September 2007. A successful simulation was performed on-site at ESA’s ESTEC science facility at Noordwijk, Netherlands, in March 2007. Six Orion Canada consultants provided quality assurance leadership throughout this exercise. Orion Canada is a full service quality system consulting company servicing industry leaders throughout North America and beyond. Orion Canada delivers quality improvement consulting, process assessment and audits, quality system maintenance outsourcing, quality assurance and customer satisfaction measurement services. Orion Canada consultants (front row: first four from right, back row: first and fourth from right) join scientific researchers and CSA and ESA managers after the simulated loading of research for space flight. Orion Canada congratulates environmental engineering company, Intera Engineering, on their successful certification to ISO 9001:2000 from the British Standards Institute (BSI). The Ottawa-based company provides hydrogeological and related environmental engineering consulting services. Orion Canada extends congratulations to Aeroguard Group on its recent successful ISO 9001:2000 audit. Aeroguard Group is Canada’s premier provider of air passenger and baggage screening, delivering best-in-class security services at 23 airports across the country including Ottawa’s Macdonald-Cartier International Airport. Orion Canada Inc. provided consulting and training aimed at achieving measurable improvement to front line operations and customer service. The company is certified to ISO 9001:2000 by NSF International Strategic Registrations Ltd..
Orion Canada Inc. is very pleased to congratulate Atlanta-based telecommunications company BellSouth (NYSE-BLS) on its flawless ISO 9001:2000 certification audit. The comprehensive quality management audit included assessment of BellSouth's business product development, professional services and managed services. It was performed by Lloyd's Register (www.lrqa.com), an accredited ISO 9001:2000 certification body. Remarkably, although not unprecedented among Orion Canada clients, not a single corrective action was raised during the audit. BellSouth Corporation is a Fortune 500 communications company headquartered in Atlanta, Georgia. Backed by award-winning customer service, BellSouth offers the most comprehensive and innovative package of voice and data services available in the market. For businesses, BellSouth provides secure, reliable local and long distance voice and data networking solutions. Following its flawless initial audit in October 2005, Biosign Technologies Inc. (www.biosign.com) was recommended for ISO 13485:2003, ISO 9001:2000, European Directive 93/42/EEC Annex II and Health Canada's Canadian Medical Device Regulations. The Toronto company designs an advanced web-based digital instrument that generates and stores a variety of vital signs from a single reading of arterial pulse. Attaining certification is essential to the company selling its products. Orion Canada congratulates Biosign Technologies on reaching this significant milestone. Orion Canada Inc. consultant Chris FitzGibbon (left), with SGS auditor Charlie Valentine (center), joining some Biosign Technologies staff after the intense certification audit. Orion Canada is pleased to congratulate semi-conductor manufacturer, Galazar Networks Inc., on its recommendation for ISO 9001:2000 certification. The company passed its October 2005 initial certification audit without a single corrective action being raised by its audit. Galazar is a leading supplier of framer and mapper semiconductor solutions focused on Ethernet over SONET/SDH (EoS), Storage Area Networking (SAN) and Multi-Service datacom and telecom applications. Orion Canada Inc. consultant Chris FitzGibbon (right), with Galazar CEO Richard Deboer, QMI auditor John Keveyuh, and Galazar Quality Manager Michelle Landriault (left). March Healthcare (www.marchhealthcare.com), a wholly owned subsidiary of March Networks Corporation, develops next generation eHealth applications. Orion Canada is pleased to congratulate their client on achieving certification to the international quality standard for medical devices: ISO 13485:2003. Orion Canada specializes in designing lean and efficient management systems for mission critical organizations. Its certified consultants and auditors have worked with clients throughout North America seeking a competitive edge or regulatory compliance. Orion Canada delivers quality improvement consulting, process assessment and audits, quality system maintenance outsourcing, and customer satisfaction measurement services. Orion Canada client, Advanced Bioelectric (www.advancedbioelectric.com), has been certified to the highest quality standards in the industry. The Canadian biomedical products company designs and manufactures leading-edge cardiac monitoring electrode technology that is changing how electro-cardiography (ECG) is detected. Orion Canada assisted Advanced Bioelectric to achieve compliance and certification to ISO 9001:2000, ISO 13485:2003, European Directive 93/42/EEC Annex II and Health Canada's Canadian Medical Device Regulations. The company has facilities in Almonte Ontario and Aylmer Quebec. Orion Canada is pleased to congratulate their client, March Networks (www.marchnetworks.com), on successfully achieving ISO 9001:2000 certification. The internationally recognized standard represents the requirements and best practices for a well managed organization. March Networks is a leading provider of Internet Protocol (IP)-based digital video surveillance solutions focused on the security industry. Orion Canada Inc. is very pleased to congratulate Montreal-based PHD Medical Inc. (www.phdmedical.com) on their flawless certification audit to the strictest international medical device standards. The audit was performed by Geneva-based SGS (www.sgs.com), one of the world's foremost independent and accredited authorities on international medical device regulations and standards. The audit verified compliance to the highest quality standards in the industry, including ISO 9001:2000, ISO 13485:2003, European Directive 93/42/EEC Annex II and Health Canada's Canadian Medical Device Regulations. The auditors recommended certification. Following the audit, Joe FitzGibbon, Orion Canada President and lead medical device consultant to PHD Medical commented, "This milestone is an achievement all staff and management at PHD Medical can truly be proud of. Under tight deadlines and a heavy workload, the entire team worked tirelessly to get this job done, in perfect order no less." Remarkably, although not unprecedented among Orion Canada clients, not a single corrective action was raised during the audit. PHD Medical (www.phdmedical.com) designs and develops portable diagnostic devices for pediatric obstructive sleep apnea (OSA) that allow pediatricians to test and evaluate their patients for OSA without the need of lab-based polysomnography. Additional information on their services is available at www.mychildsnores.com and www.etrending.com. Orion Canada Inc. is a full service quality system consulting company servicing industry leaders throughout North America. Orion Canada Inc. delivers quality improvement consulting, process assessment and audits, quality system maintenance outsourcing, and customer satisfaction measurement services. Before an audience of quality professionals in Ottawa, Orion Canada Inc. consultants Stephen Davies and Chris FitzGibbon shared their approach and some tools used to achieve short term, high impact and measurable process improvement during a recent consulting assignment with Canadian peace keeping operations in Afghanistan and Bosnia. The presentations were to the Ottawa chapters of the American Society for Quality - Canada (ASQ-Canada) and the Canadian Public Service Quality Association. Additional information on these organizations is available at www.asqottawa.ca and www.cpsqa.ca. The presentation is available for download: "Quality Improvement in Hostile Environments". Orion Canada Inc. consultants Stephen Davies and Chris FitzGibbon will present to the Ottawa chapter of the American Society for Quality - Canada (ASQ-Canada) on November 9, 2004 and the Canadian Public Service Quality Association on November 24, 2004. The presentation, entitled "Process Improvement in Challenging Environments" will summarize the short term, high impact successes achieved during a recent consulting assignment with Canadian peace keeping operations in Afghanistan and Bosnia. Additional information on this meeting is available at www.asqottawa.ca and www.cpsqa.ca. The Canada School of the Public Service (CSPS) has selected Orion Canada Inc. for course design & development and instruction. Ottawa-based Orion Canada will provide CSPS with certified consultants and professional trainers with the subject matter expertise to develop and deliver world class process improvement, quality management and business excellence courses for public service participants. Orion Canada assists organizations to improve operational efficiency and effectiveness through the implementation of process and management best practices that positively impact the bottom-line. Orion Canada's expert consultants specialize in process audit & assessment, design and implementation of lean and measurable quality management systems, quality system maintenance outsourcing, and performance measurement. Orion Canada is pleased to congratulate Canbreal Therodiagnostics International Inc. (Ottawa, Ontario) on achieving ISO 13485:2003 registration. The management and staff of Canbreal are deserving of credit for this significant accomplishment. Orion Canada is Canada's leading consultancy on ISO 13485:2003 and other medical device standards and regulations. Orion Canada Inc. is pleased to announce the completion of its onsite engagement at the Canadian Forces base in Kabul, Afghanistan. Orion Canada specializes in operational efficiency and process improvement, and was engaged through Department of National Defence (DND) contractor SNC Lavalin PAE to assist with the performance and quality improvement of Canadian peace keeping operations in overseas theatres. to personnel at Camp Julien in Kabul, Afghanistan. Camp Julien is the main base for Canadian troops serving with the NATO-led International Security Assistance Force in Kabul. Joe FitzGibbon, a recognized authority on medical device quality system requirements, has been invited by The Management Roundtable and the FDA News to present a comprehensive workshop at the Quality in Device Manufacturing: The New Global Profit Center conference in San Diego, California. The workshop on March 30th, 2004, will provide participants with critical information on developing quality systems to adhere to the FDA Quality System Regulations, Canada's Medical Device Regulations and ISO and E.U. standards. The presentation also examines the relationship of these requirements and best practices for compliance. Registration for the two day conference (March 30 - 31, 2004) may be made by phone (800-338-2223) or at the Roundtable website: www.roundtable.com/md.html. Orion Canada is recognized as a leader in designing, implementing and assessing medical device quality systems. Joe FitzGibbon is President of Orion Canada Inc. and the author of Quality System Requirements for Medical Devices (Industry Canada, 2001). Orion Canada Inc. has been awarded a contract to assist with the performance and quality improvement of Canadian peace keeping operations in Kabul, Afghanistan and Bosnia. The contract, through Department of National Defence (DND) contractor SNC Lavalin PAE involves the deployment of Orion Canada consultants to the two theatres in April 2004. Orion Canada is pleased to congratulate Capital Box and Fugro Airborne Surveys on achieving ISO 9001:2000 registration. The leadership position that both organizations hold in their respective industries was validated by their exemplary performance during their flawless ISO 9001:2000 audits. The management and staff of Capital Box and Fugro Airborne Surveys are deserving of credit for this significant accomplishment. Orion Canada is pleased to introduce its newest associate: Stephen Davies. Stephen M.Sc., AIQA, CQMgr brings years of operations expertise (Supply Chain, Lean Systems, Industrial Engineering, Forecasting, Planning, Materials Management and Inventory Management) in addition to quality improvement skills (Quality Systems, Standards, Tools, Methodologies and Auditing). Stephen will assist Orion Canada clients to demonstrate measurable bottom-line improvements through efficiency improvement. He may be contacted at our downtown Ottawa office at (613) 563-9000 or through email stephen@orioncanada.com. 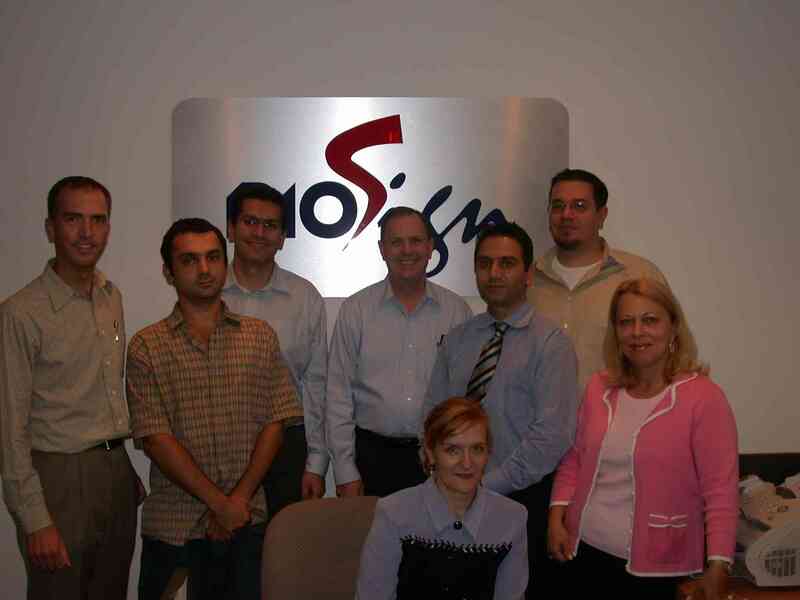 2003 A Record Year for Orion Canada Inc.
Orion Canada Inc. completed 2003 with record revenue and client growth. From its headquarters in downtown Ottawa Ontario, Orion Canada consultants served clients throughout North America. In 2003, Orion Canada consultants served clients in Toronto, Montreal, Vancouver, Ottawa, Boston, Atlanta, New York, Washington, Philadelphia, and several other centers. The consultancy designs, implements and assesses performance and quality improvement strategies for the medical device, software/IT/technology, manufacturing and service industries. Orion Canada thanks all of its clients for a record 2003 and wishes them a safe and prosperous 2004. Orion Canada consultants have been engaged by Bell South Communication Systems (BCS) to provide quality management improvement services to the Atlanta-based provider or voice and data communication solutions for businesses in Georgia, Florida, Alabama, Mississippi, Louisiana, Kentucky, Tennessee and North & South Carolina. Orion Canada specializes in assisting technology companies to improve organizational efficiency and effectiveness performance through process improvement and best practice models. In the last year, Orion Canada consultants have assisted more than 50 leading technology companies to improved performance. Orion Canada consultant Chris FitzGibbon presented "Developing an ISO 9001 Management System on a Shoe String Budget" to the Semiconductor Special Interest Group of the Ottawa Manufacturers Network (OMN). Orion Canada specializes in assisting technology companies to improve organizational efficiency and effectiveness performance through process improvement and best practice models. The purpose of the Semiconductor Special Interest Group is to provide a collaboration and networking forum for industry professionals involved in Semiconductor Operations’ activities such as technology selection, supply chain management, logistics, test and packaging, quality and reliability, etc. Orion Canada consultant Chris FitzGibbon addressed the American Society for Quality (ASQ) in Ottawa. The presentation provided advice on transitioning to ISO 9001:2000. The deadline for transitioning from ISO 9000:1994 to the ISO 9001:2000 standard is December 15, 2003. In December 2000, two Orion Canada clients became the first organizations in North America to achieve ISO 9001:2000 registration from an accredited registrar. 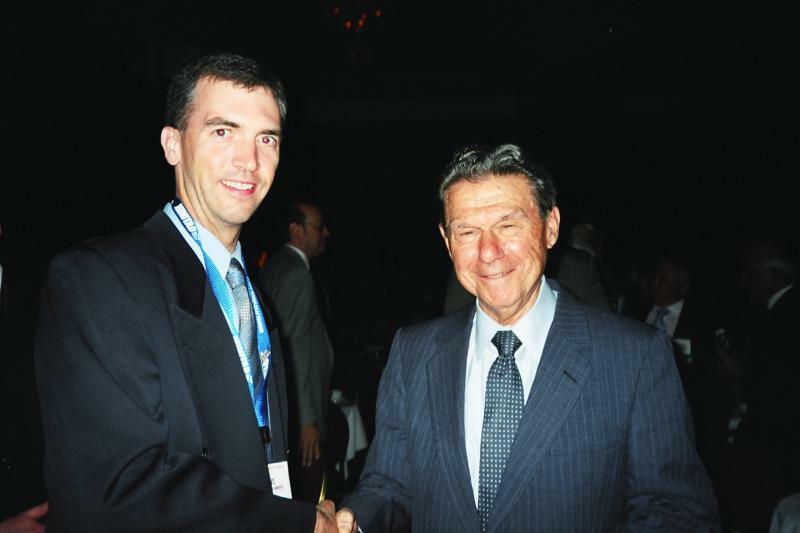 In May 2003, Chris FitzGibbon was presented the prestigious Feigenbaum Medal in recognition of outstanding characteristics of leadership, professionalism, and potential in the field of quality through achievement of significant benefit to mankind. At the request of the Ottawa Software Quality Association, Orion Canada consultant Chris FitzGibbon presented to software professionals on getting measurable value from an ISO 9001:2000-based software development methodology. The presentation also examined the ISO 9001:2000 lessons learned that are unique to the software industry. Orion Canada is recognized as a leader in designing, implementing and assessing software development practices. Chris FitzGibbon has performed hundreds of software process audits and assessments, including regulatory audits of mission critical and medical device software applications. He is the author of ISO 9001 Registration for Small and Medium Sized Software Enterprises (McGill-Queens Press, 1995) and several articles based on research on software process improvement practices. Orion Canada consultant Chris FitzGibbon addressed the American Society for Quality (ASQ) at the organizations Annual Quality Congress (AQC) today while accepting the prestigious 2002 Armand V. Feigenbaum Medal. The Feigenbaum Medal is awarded in recognition of outstanding characteristics of leadership, professionalism, and potential in the field of quality through achievement of significant benefit to mankind. Orion Canada is pleased to announce that Chris FitzGibbon, a lead consultant and a company co-founder, has been nominated for the prestigious Armand V. Feigenbaum Medal. The medal recognizes accomplishments and potential in quality. Orion Canada expresses its deepest sympathies to the families of the seven astronauts who perished aboard the Space Shuttle Columbia. It was two weeks earlier, on January 16, 2003, that Orion Canada personnel watched the launch of STS-107 along side the families of the astronauts at the Kennedy Space Center in Florida. Aboard the shuttle were approximately 80 scientific experiments, two of which Orion Canada Inc. had been extensively involved: the OSTEO and ERISTO experiments on the impact of microgravity on bone density. The seven astronauts risked their lives for science and the betterment of mankind. They were heroes. May they rest in peace. Orion Canada was part of a Canadian Space Agency and European Space Agency team that has placed scientific experiments on the Space Shuttle Columbia STS-107. The Orion Canada team of 8 consultants provided QA services on projects investigating the impact of microgravity on bone density. Orion Canada consultants are providing expert-level quality assurance for experiments that are being prepared for the launch of STS-107 on January 16, 2003. An Orion Canada team of eight consultants are working at various locations throughout North America, including onsite at the Kennedy Space Center in Florida. Once all aspects of each experiment are complete, Orion Canada consultants will fly the experiments on private jet directly to the Kennedy Space Center where they will be joined by the four other experiments for immediate loading to the Space Shuttle payload. Orion Canada Inc., the leader in quality system design and implementation for medical device manufacturers, has partnered with CanReg, global regulatory affairs consultants, to offer the medical device industry a comprehensive and practical course on medical device quality system regulations. This course focuses on the practical "how-to" knowledge required to successfully design and implement a quality system for a medical device manufacturer selling product in Canada, the United Stated or the European Union. It will also be among the first courses to review the content of the draft DIS/ISO 13485:2003 standard. The 2 day course "Regulatory Compliance for Medical Device Quality Systems" will be held on January 29-30th, 2003 in Holiday Inn Select - Toronto Airport. Contact Orion Canada to register. Orion Canada is pleased to be partnered with OrbitIQ (www.orbitiq.com), a strategic alliance of industry leading players based in the U.S and Canada, and globally connected. OrbitIQ has created a new business model built around a North American wide channel and market excellence, aimed at helping companies that are struggling to get their product to market because of shortage of sales support or channel coverage. Many companies with innovative products spend excessive time on product development and overlook the fact that products need to be marketed, sold, and converted to cash. OrbitIQ personnel augment the sales and marketing effort of these companies and accelerate product traction through maximum market penetration in the shortest time frame. OrbitIQ has have built a set of strategically placed teams (the most notable in New York), that have very high level interfaces into key market sectors. The two target markets are Enterprise, especially the Financial Services vertical and telecomm companies (particularly wireless apps). Orion Canada joins this alliance as the experts in management and quality system design and implementation. Orion Canada clients Lincien College (www.LincienCollege.com), Gilmore Global Logistics, and Doculink International (www.doculink.com) have become industry leaders by achieving ISO 9001:2000 certification. Less than 10% of ISO 900x:1994 have upgrade to the new standard. NuMED (US) and NuMED Canada have each been registered to ISO 9001:2000, ISO 13485 and CMDCAS. Through its validated design methodology, Orion Canada has distinguished itself as the leader in designing, implementing and assessing ISO 9001:2000, TL 9000, ISO 13485, EN46000, MD 93/42/EEC and CMDCAS quality systems. Orion Canada is pleased to introduce Andrew Meldrum as its Director of Business Development. Andrew brings years of project management experience at Nortel Networks and Computer Sciences Corporation (CSC) to the Orion Canada team. He will work to build new relationships with organizations committed to improving their efficiency, effectiveness and customer satisfaction. Andrew may be contacted at our downtown Ottawa office at (613) 563-9000 or through email andrew@orioncanada.com. CR Wall (Brockville), an Orion Canada client that achieved ISO 9001:2000 registration in May, has signed a new contract for Orion Canada to perform independent client satisfaction measurement. And, the highly respected Oxford Consulting Company (Ottawa) has engaged Orion Canada to provide quality improvement consulting to its clients. Orion Canada Inc. extends congratulations to two more of its clients who were successfully registered to ISO 9000 in September. Halifax-based medical device manufacturer Biomedica Diagnostics and Ottawa-based Commercial Printing both passed audits without incurring any corrective action requests or nonconformities. Orion Canada Inc. has entered a strategic alliance with the Canadian Public Service Quality Association (CPSQA). The intent of the alliance is to raise Orion Canada's profile among CPSQA members. The Ottawa-based consulting company will also host and maintain the CPSQA website: www.orioncanada.com/cpsqa. Orion Canada consultants have worked on several successful quality-related projects for government organizations, including: Treasury Board Secretariat, Fisheries & Oceans, Department of National Defence, Department of Foreign Affairs, the Canadian Space Agency, and Public Works and Government Services Canada. Orion Canada Inc. is pleased to announce another client that has achieved certification to ISO 9001:2000. C.R. Wall & Co. Ltd. of Brockville, Ontario engaged Orion Canada in November 2000 to assist it to implement an efficient quality system. The culmination of this effort was the successful registration audit. Congratulations to C.R. Wall and all of its staff who made this effort possible. Orion Canada Inc. is Canada's leading quality system consulting firm specializing in government, IT and the biotechnology/medical device industries. Ottawa-based consulting firm, Orion Canada Inc., continues to be distinguished as Canada's leader in quality system consulting. On March 30, 2001, Industry Canada published Orion Canada's 2001 Quality System Requirements for Medical Devices. Previous editions of this publication have been used by hundreds of companies in Canada and abroad to identify the quality system requirements for the sale and export of medical devices to Europe, the United States and Canada. The 158 page publication is available FREE to medical device companies. Orion Canada is pleased to have provided process management and quality assurance services for a research project on the impact of weightlessness on bone density. In February and March 2001, the leading edge experiment was performed at the European Space Agency (ESA) research facility in Holland by scientists from Italy and France. Orion Canada produced detailed scientific procedures and managed the integrity of the process. The objective of the project is to eventually discover a treatment or cure for Osteoporosis. An Orion Canada team of 5 quality assurance professionals is participating in ongoing research projects in Europe and Canada. The Canadian research projects are sponsored by the Canadian Space Agency (CSA). A NASA space shuttle mission in January 2003 will be used to perform the experiments in a weightless environment. Orion Canada QA professional, Sylvie Guilbeault (left), with scientists from France in the ERISTO laboratory at the ESA's research facility in Holland. Cisco Systems (San Jose, CA), a leader in internet and networking solutions, has chosen Orion Canada Inc. consultants to provide value-added process assessments to channel partners throughout North America. Orion Canada employs two Cisco Certified Auditors. Orion Canada is pleased to announce that another of its clients has passed its ISO 9001:2000 audit and is now registered to the new standard. WorldReach Software Corporation (www.worldreachsoftware.com), develops software products for international travellers and case management. Its software is used in more than 130 countries. Orion Canada has expertise in software quality and includes many high tech companies among its clients. AMITA Corporation, has become the first organization in North America to be officially certified to the new ISO 9001:2000 standard. The certificate was presented to the software consulting services company on December 15, 2000 by the Canadian General Standards Board (CGSB). The ISO 9001:2000 standard is the most anticipated business standard in history. Orion Canada provides quality management services to AMITA and was responsible for managing the upgrade of the company's quality system to the new ISO 9001:2000 standard. 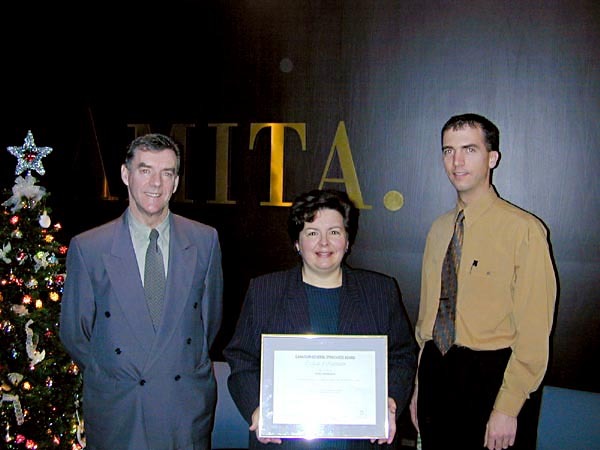 On December 15, 2000, AMITA became the first company in North America to be certified to the new ISO 9001:2000 standard. 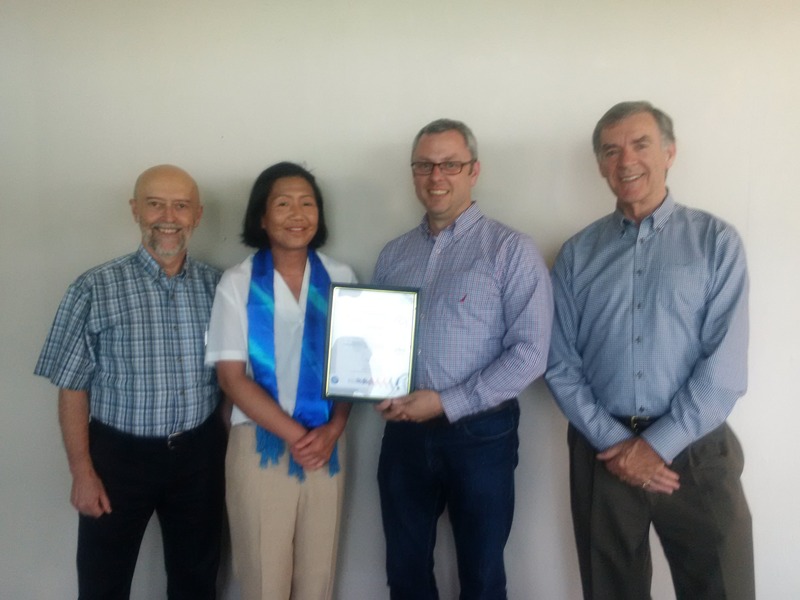 From left to right, Joe FitzGibbon (President, Orion Canada Inc.), holding the ISO 9001:2000 certificate is Monica Preston (President, AMITA Corporation), and Chris FitzGibbon (Software Quality Consultant, Orion Canada Inc.). The most anticipated business standard in history was published on on December 15, 2000. Members of the ISO Technical Committee ISO/TC 176 overwhelmingly approved the release of ISO 9001:2000 Quality Management Systems - Requirements. Only minor editorial corrections were made to the FDIS version. Some definitions relating audits were also modified in the vocabulary section of ISO 9000:2000 Quality Management Systems - Fundamentals and Vocabulary. Orion Canada Inc. has established a leadership position with the ISO 9001:2000 standards. Several Orion Canada clients are implementing or upgrading their quality systems to the new standard. The experiences of one Orion Canada client are featured in the August 2000 issue of the Capital Quality News and the upcoming issue of Calibre, a publication by the Canadian General Standards Board. Orion Canada is pleased to announce the launch of a promotion strategy which includes advertisements in Ottawa's premiere business weekly publication, the Ottawa Business Journal. The campaign will continue until mid-September. Orion Canada Inc. is pleased to extend congratulations to its client, Thomson Nielsen, on their recent certification audit. On June 14, 2000, Thomson Nielsen was recommended for registration to ISO 9001, ISO 13485, EN 46001, and CE Mark. Thomson Nielsen is an internationally recognized leader in the development and manufacture of radiation measurement devices. Orion Canada assisted the company in designing and developing their Quality System to comply with the applicable medical device standards as well as the US FDA Quality System Regulation and Health Canada's Medical Devices Regulations. Orion Canada is Canada's leader in designing quality systems for medical devices companies. 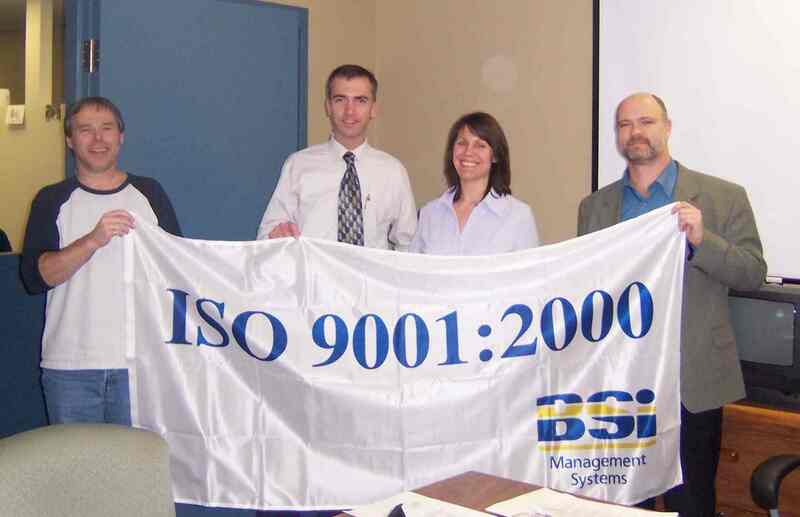 On May 30, 2000, an Orion Canada Inc. client, AMITA Corporation, was the first organization in Canada to have compliance to ISO 9001:2000 assessed during an audit by the Canadian General Standards Board (CGSB). Orion Canada has assisted AMITA Corporation to fully implement the requirements of latest draft of ISO 9001:2000. Official recognition through a registration certificate to ISO 9001:2000 is not possible until the official publication of the standard late in 2000. Orion Canada assists organizations to implement strategies for quality improvement and management excellence. Orion Canada Inc. is pleased to announce the compliance of one of its clients to the DIS/ISO 9001:2000 standard. AMITA Corporation, providers of frontline software solutions used in more than 130 countries, has fully implemented the requirements of latest draft of ISO 9001:2000 and the company is scheduled to be among the first software companies in Canada to be audited against the new standard. Official recognition by the quality registrar is not possible until the official publication of the standard late in 2000. NuMED Canada, a medical device manufacturer in Cornwall, Ontario, has successfully re-registered their quality system to the ISO 9002, EN 46002 and ISO 13485 standards. Orion Canada Inc. has worked with NuMED Canada since 1995 to design, implement and maintain a business-friendly quality system that will withstand the scrutiny of the strict medical device quality standards. Originally registered to ISO 9002 in 1996, NuMED Canada underwent a complete re-audit of their quality system as part of the 3 year registration cycle. Congratulations! Reliable Plating, a specialist in the metal plating industry, has achieved a milestone in its journey toward continuous quality improvement and customer satisfaction. In mid-July, the company was highly successful in its inaugural ISO 9002 registration audit. Reliable Plating has implemented an innovative and user friendly quality system to serve its needs and those of its customers. Orion Canada Inc. would like to congratulate its client, Reliable Plating, and all of its staff on this significant achievement! Another Orion Canada Inc. client has passed their ISO 9002 registration audit. Tri-Graphics Printing, a leader in Canada's book publishing industry, is the sixth Orion Canada client to successfully achieve ISO 9000 registration in the last year. Congratulations to Tri-Graphics and their staff on this great achievement! Orion Canada Inc. would like to congratulate Doculink International on their overwhelmingly successful ISO 9002 registration audit in March 1999. All of the hard work and dedication staff of the electronic and printing company paid off: no corrective actions or observations were identified during the audit. In 2000, the International Organization for Standardization releases the replacement for ISO 9001: 1994. The revised standard has undergone extensively revisions. All ISO 9000 registration holders are expected to update their quality system to the new standard, usually within a year of its release. Orion Canada Inc. can assist your organization in proactively updating your quality system. Visit Orion Canada's ISO 9000: 2000 web page describing the forthcoming standard, the highlights and the contents of the revised standard. Orion Canada also offers customized courses and workshops for Management, ISO Coordinators, Internal Auditors, the Quality Management Committee and the Staff. Contact us for more information and prices. A reference guide detailing the medical device quality system requirements for Canada, the U.S. and the European Union is now available! This 200+ page guide was researched and written by Orion Canada Inc. for Industry Canada. Contact Joe FitzGibbon for more information.